Leema Acoustics Quasar is an amp, DAC and streamer in one | What Hi-Fi? 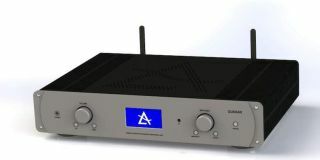 The new streaming amp/DAC is the latest addition to the company’s Stellar series and will be on display at the Bristol Show 2016. Leema has fitted the Quasar with dual mono output sections, delivering 200W into 8 ohms. The internal DAC is based on Leema’s own Quattro-infinity design found in its flagship Libra DAC, which offers “faithful conversion for digital data to analogue signal”. Quasar features three coaxial and three optical digital inputs alongside Leema’s M1 asynchronous USB interface and Bluetooth is onboard too for wireless streaming. The DAC will play back hi-res audio formats up to 24-bit/192kHz and supports DLNA/UPnP streaming, with a dedicated app available for Android and Apple devices. Music streaming service Deezer and vTuner Radio come preinstalled, with others due to be added in the future. The Leema Acoustics Quasar will be launched later in 2016, priced £2995, but you’ll be able to have a sneak preview at the Bristol Show.